The Dinner Party first opened to the public at the San Francisco Museum of Modern Art on March 14, 1979. Five thousand people attended the opening, and during its three months on view, approximately one hundred thousand people came to see it. After its premiere, The Dinner Party went on a nine-year international tour sparked by grassroots efforts to find exhibition venues for the piece. The tour began in North America at the University of Houston at Clear Lake, Texas, and continued to venues in Boston, Brooklyn, Cleveland, Chicago, Atlanta, and across Canada. The tour continued through Europe at the Edinburgh Festival Fringe, Scotland; The Warehouse, London; and Schirn Kunsthalle, Frankfurt, Germany; ending at the Royal Exhibition and Conference Center in Melbourne, Australia, in 1988. The exhibitions were hugely popular, drawing large crowds at every venue—for the European tour alone the total viewing audience was over a million people. During its worldwide tour, The Dinner Party received an enormous amount of press, both positive and negative. Chicago’s desire to create a new visual language with which to express women’s experience and to promote social change by creating respect for women’s history and productions was not well received by the art world at large. Many described the work as “bad art” or “kitsch” without, of course, recognizing Chicago’s deliberate reclamation of “women’s work” as a feminist strategy. Some critics praised the work’s socio-political content; others attacked the “central core” images as literal vaginas rather than metaphoric celebrations of female power. Several reasons can be deduced from the negative reactions. The most obvious one was the fear of feminism itself. The Women’s Liberation Movement had been, and continued to be, deeply threatening to both women and men. A feminist work of art on this monumental scale with challenging subject matter was bound to provoke controversy. When the work returned to the U.S. in 1988, it was stored at the National Museum of Women in the Arts, Washington, D.C., which lacked large enough exhibition space to present it. Plans began to locate a permanent home for the piece, which was a long-time goal for Chicago. To her delight, in 1990, the Trustees of the University of the District of Columbia voted to accept her gift of The Dinner Party for their collection and dedicate funds for its installation in a new gallery in the Carnegie Library. Because Congress controls this University’s budget, however, congresspersons who deemed the piece “pornographic” and “offensive” debated the purchase in televised congressional proceedings and a controversy ensued questioning the “value system” the artwork demonstrated. Ultimately, the acquisition was denied. 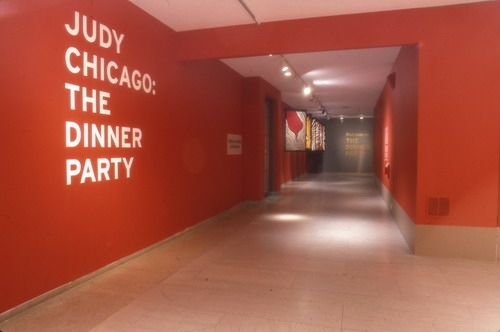 The Dinner Party returned to storage until 1996, when it was exhibited at the Armand Hammer Museum at UCLA in the exhibition Sexual Politics: Judy Chicago’s Dinner Party in Feminist Art History, curated by Amelia Jones. It once again drew large crowds, and virulent criticism. After the Sexual Politics exhibition, The Dinner Party returned to storage to face its ambiguous future. Dr. Elizabeth A. Sackler, philanthropist and board member of the Brooklyn Museum, began discussing the possibility of the Center with Museum director Arnold Lehman and Museum staff. 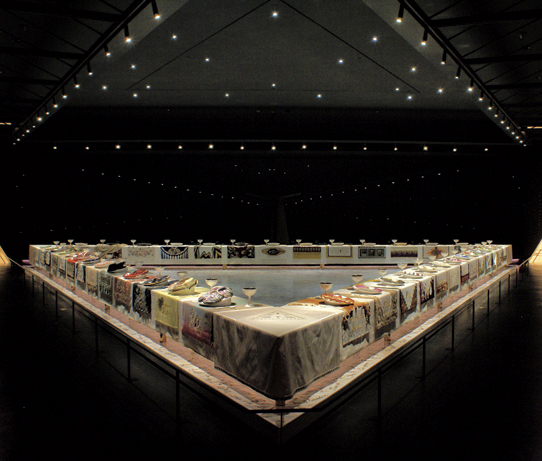 In 2002, the Elizabeth A. Sackler Foundation purchased The Dinner Party, gifting it to the Museum; the artwork was presented as a special exhibition at the Brooklyn Museum where 80,000 people came to see it. The Dinner Party has found its home.